There are so many reasons why I love this buttercream recipe. I love the that is only uses 5 ingredients, which most of us already have in our pantries! It also is seriously the easiest recipe; it’s pretty much foolproof, and only takes about 5 minutes to make. Can buttercream icing be made ahead of time? Can buttercream frosting be frozen? Can buttercream frosting be left out overnight? Which type of buttercream do you use? Why does my frosting have air bubbles in it? How do I get the air bubbles out of my buttercream? Why is my buttercream grainy? Is this a crusting buttercream recipe? Does buttercream frosting go bad? Can this recipe be used to pipe flowers? Why is my buttercream yellow? Why isn’t my frosting white? How do you get such vibrant colored frosting? I’m here to answer all of these and more! So buckle up, and get ready to learn everything (and more) about American buttercream frosting. The fundamentals, troubleshooting, and of course, my recipe!! Can I Make My Buttercream In Advance? A common theme in these questions involves making buttercream in advance, and storing it. I almost always make my frosting ahead of time. If placed in a large, sealed piping bag or airtight container, it can last in the fridge for up to a month, and in the freezer for up to three months. he amount of time it takes to thaw can vary based on the amount of frosting, and how it’s stored. I usually take my buttercream out the night before I need it. Once the buttercream has reached room temperature, it will likely be riddled with tiny air bubbles!! But fear not, you can get your frosting back to a silky smooth consistency. Simply mix it on a low speed with a paddle attachment, or by hand with a rubber spatula. I do this with every batch of buttercream, to make it easier to get super smooth sides on my cake. How Long Does Buttercream Keep At Room Temperature? And the simple answer is no. The high amount of fat and minimal amount of cream keep it from spoiling. Trust me, I leave my frosting out overnight all the time, and I’ve never gotten sick from it. Do I Need To Sift My Powdered Sugar? A lot of recipes ask you to sift the powdered sugar before adding it into the frosting. I don’t know how you feel about sifting, but to me it’s always such a pain! It is important to sift the powdered sugar if you have trouble with it clumping when you add it into your buttercream. However, most powdered sugar in the United States is mixed with a tiny bit of cornstarch, to naturally keep it from clumping. Cornstarch helps absorb moisture, which can cause clumps. I’ve never had an issue with my powdered sugar clumping, and a few years ago I decided to be rebellious and skip the sifting. And you know what? My frosting turned out EXACTLY THE SAME! I don’t sift my powdered sugar anymore for frosting!! If you live in a humid environment, you may have issues with clumps in your powdered sugar. You also might run into this if you live in another country where your powdered sugar doesn’t contain cornstarch. If this is you, it may be necessary for you to sift. Some people also run into the issue of grainy frosting! When the texture of you buttercream isn’t nice and smooth, it may be because you need to add a bit more heavy cream (1 TBSP at a time)! If there isn’t enough liquid in your frosting to dissolve the sugar, it can throw off the texture of your frosting. Sometimes adding additional heavy cream doesn’t solve the problem. When you run into this, the grainy texture might be caused by the brand of powdered sugar you’re using! Some brand are less fine than others, and in some place of the world powdered sugar is also less fine. I usually use the Domino or Shoprite brands, which are both 10x. When you see this on a package, it refers to the the number of time the sugar is processed to make it into the fine powder that we know and love. Be sure to check your package when you buy it, to be sure it’s been processed to a fine enough powder! Why Is My Buttercream Hard / Why Does Buttercream Crust? My recipe crusts overtime as the frosting is left exposed to air, due to it’s high sugar content. But it’s really not a bad thing. In fact, most of the time it’s actually a great thing! Crusting buttercream recipes are usually stiffer due to the high amount of powdered sugar, and therefore easier to smooth on cakes. Other benefits of crusting include reduced risk of bulging sides, the ability to paint designs onto a cake, and it helps piped flowers or designs keep their structure. What Is American Buttercream Frosting? How Is It Different than Swiss Meringue Buttercream? Based on the minimal list of ingredients, you can probably tell this is an American Buttercream Frosting (ABC)! The noticeable difference between American buttercream and other types of buttercream is that it doesn’t use any egg whites! American buttercream frosting is primarily made with butter, loads of powdered sugar, and a bit of salt, vanilla, and heavy cream. While there are tons of delicious types of buttercream out there (Swiss, German, Italian, French…), I prefer ABC! I don’t like to mess with eggs when it comes to frosting, and I enjoy the way American buttercream tastes. As most of you know, I have a huge sweet tooth, and Swiss Meringue Buttercream (SMBC) honestly isn’t sweet enough for my palette. I ate loads of sugary candy, sweet breakfast cereals, and sweetened beverages as a kid. My brain has been hard-wired to just love sugar over the years. How Do I Make My Buttercream White? Why Is My Buttercream Yellow? One last thing to note when making this American Buttercream!! Since this recipe is only 5 ingredients, each ingredient really counts when it comes to flavor and consistency. With this in mind, the brand of butter you use has a huge impact on the taste and color of your frosting!! Some brands of butter are more yellow, either based on the diet of the cows producing the milk (cows eating a lot of grass will produce yellower butter due to the beta carotene in the grass), or if a brand adds in coloring (always check the ingredients!!). My go to brand of butter is the unsalted Whole Foods brand. It is very light in color, and makes very white frosting! If you can’t find a brand of butter that is lighter in color and your frosting is still a bit yellow, try adding the smallest (TINIEST) drop of purple gel food coloring. It sounds crazy, but purple and yellow are opposites on the color wheel, so they cancel each other out. The purple gel food coloring will color-correct the yellow tint, leaving you with white frosting. Can I Use This Recipe To Make Other Flavors of Frosting? I use this icing as the base of every frosting I make, and then make tweaks to recipe to flavor it. This is the perfect frosting base for any flavor! The possibilities are limitless. When I make variations and plan to use a different extract, I usually swap out 1 or 2 tsp of vanilla, and replace them with my extract of choice. This is what I do for coconut, lemon, mint, almond, ube, and maple buttercream! Some flavors require mixing in an addition ingredient, like Nutella or peanut butter. For these, I replace 1 or 2 sticks of butter with the ingredient of choice. For example, to make Nutella frosting, I use three sticks of butter, and a half cup of Nutella. I then add some additional heavy cream, since the Nutella makes the frosting thicker than standard buttercream. This approach works great for cream cheese frosting, salted caramel, peanut butter, Nutella, and cookie butter frosting. How Do I Color My Buttercream To Make Bright And Vibrant Shades? Now onto coloring frosting! To make my buttercream super vibrant and colorful, I use gel food coloring. It allows you to get vibrant colors without adding a ton of liquid into the frosting. This can throw off the consistency of the buttercream. My favorite gel food coloring is Americolor, and it’s the only food coloring I use. How Much Buttercream Do I Need To Make For A Cake? When using this to frost my favorite vanilla layer cake recipe , I usually make 1.5 batches. However, this can vary based on how I’m decorating the cake. A lot of the time I have leftover frosting, but I’d always prefer to have leftover frosting, rather than run out! I don’t mind since it can easily be saved to use on another cake. Plus, like I mentioned above, leftover buttercream keeps in the fridge for up to a month if it’s stored correctly! One batch of this recipe makes 9-10 cups of frosting. When you’re first starting out though, that doesn’t mean much! You’ll learn overtime how much frosting you like to add between the layers, and much extra frosting you need to create the decoration you have in mind. For example, a semi-naked cake uses less than one batch of frosting. On the other hand, if you chose to decorate a cake with buttercream rosettes, you may use two entire batches of frosting! This American buttercream recipe only uses five ingredients! It's so easy and delicious to make, you'll never buy frosting again!! I usually make 1 1/2 batches of frosting to stack and frost a seven or eight inch cake. Hello!!! I can substitute heavy cream for whipping cream, in my country there is no heavy cream??? You can use whatever milk you want 🙂 whole milk is probably the best replacement, but you can also use skim milk!! Hi!!! How much icing does this yield? Do you mean in weight? how much icing does this make?? as in the amount in grams or the yield? I’ve never weighed a batch of frosting before, but it makes about 6-7 cups of frosting! how much icing does this make in grams or how much does it yield? I’m not sure! I usually make one batch to cover a 4 layer cake with seven inch cake rounds! how do you make theroses toactually look like roses? The buttercream rosettes shown here are piped with a Wilton 1M! You can also pipe real roses with an Ateco 126 or a Wilton tip #12. How much is 8 cups powdered sugar? Do you use the paddle attachment for mixing this? I can never get mine so smooth even for the rosettes. There always seem to be tiny air bubbles in the frosting itself (even before it’s on the cake). Also, is there a specific butter brand you usually use? aww so happy to hear that!! Hi, If i want chocolate buttercream do i just add melted chocolate? at which stage and how much as per your recipe? I usually add about 1/3 cup of baking cocoa for chocolate buttercream, and mix it in once the powdered sugar is fully mixed in! What do you add to make cookie dough butter cream? brown sugar, and extra vanilla! 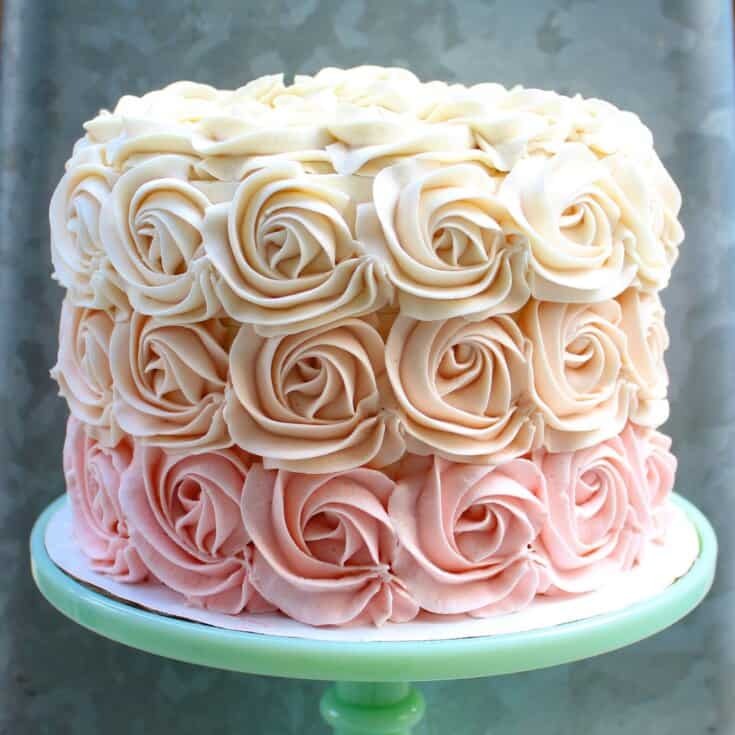 What cake tip did you use on the ombré rose cake picture? I love your tutorials – what an inspiration! Can I leave it in room temperature overnight? I would like to make the cake a night before and Im alfraid the cake will gethardwhen I put in the fridge. Thanks! Help! I refrigerated the icing. Will I be able to salvage it once it comes back up to room temp?? yes! just give it a good stir, to make sure the consistency is nice and smooth! What I mean I will decorate the cake with buttercream night before…the buttercream is already on the cake overnight. Hello! I have a question, I know you said that your buttercream is a crusting buttercream which I love to work with, but I usually do shortening and butter because I’ve had experiences where using strictly butter makes the frosting “loose” and not easy to work with. Have you ever had this problem with this recipe? I actually never have! I very rarely use shortening! I add very little cream, which keeps my frosting pretty study and easy to frost with! I live in NYC,and never really have problems with temperature or humidity in my kitchen though, I know that people encounter issues related to that other places in the world ! Sounds like you guys would prefer a swiss meringue buttercream! I’d try that! Hmm! 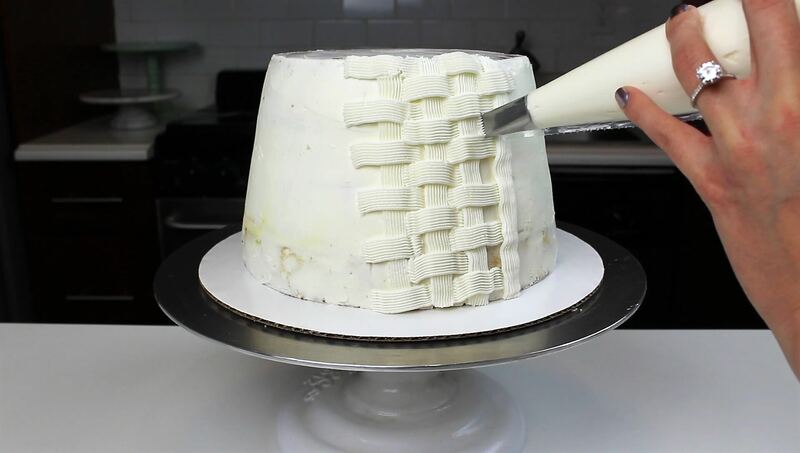 If you’re having trouble piping, you can always add in a bit more cream to make it easier to pipe! I usually add in slightly more cream when piping vs. covering a cake. Hope that helps! Can you use salted butter instead of unsalted? If so, what is the difference? sadly you can’t! The texture won’t be right! Do you have a recipe for cream cheese frosting? I just swap out half a stick of butter for 4 oz. of cream cheese! Can I make this ahead of time and store in the refrigerator? definitely! I usually do! just give it a good stir after it’s thawed before using it! I’m wanting to use this for my wedding cake but I did a trial run and the next day it had kind of dripped some white wax looking stuff onto the counter (I’m assuming this was butter maybe?) Have you run into this problem before or know how I could solve it? I love everything about this frosting but want to make sure it is perfect for the wedding. Would using half butter half butter shortening help do you think? This is the only recipe that I will ever use when making icing….. No more store bought icing….. Thanks so much for sharing this. just updated the recipe to include grams! Hi there! I too am a baker and I’m always looking for new inspirations and recipes and I have never heard of using salt or heavy cream in my recipe! I am making a birthday cake tonight for a friend so I’m giving your recipe a try! I hope it works! You do incredible work and your cakes make me just wanna be in my kitchen all day long baking and trying new flavors!! I have a question about your actually vanilla cake recipe though.. does it come out rather dense like pound cake or is it fluffy and soft like a sponge cake? I want to make this recipe for my sons birthday cake but I don’t have a processor with a paddle attachment. Can I use a hand mixer instead? Will it come out the same? It’s all about the brand of butter you use! some are naturally more yellow, others less! I use the whole foods unsalted brand. hope that helps! I have used this recipe for icing before and it is perfect! Thank you! I am making a cake for the office and it will probably be sitting in the break room a few days before all of it gets eaten. Will this icing be ok left out? Or, would you put in the fridge instead of leaving it out? Thanks! I would put it in the fridge if it’ll be more than a day! Thanks so much for the fast reply! If I don’t have a paddle attachment, are the regular standard beaters ok? Hi Chelsea, I follow you on IG and I’m making my first homemade frosting using your recipe for my son’s birthday cake this weekend. If I can’t get to a Whole Foods in time, could you recommend another light colored butter that I can use?????? My cake is a football field and I’m mostly using green but I worry the frosting areas that need white will not be as white if I use a butter than isn’t the Whole Foods brand. Hi, just curious… Will it affect the texture if I reduce the sugar half (4 cups)? it will change the texture and taste quite a bit!!! I live in Mississippi where it’s a little warmer I’m concern if the buttercream will hold up with the temperature. Is it alright that the icing sugar is still grainy after 30minutes of mixing? The frosting shouldn’t be grainy at any point! If you are using powdered or confectioner’s sugar, it should be super fine, powdery, and never grainy! I want to bake the cake tonight and frost the cake. The party is tomorrow. Can the cake be left out at room temp.? Should I refrigerate the frosted cake? If so how long before he party should I removed the cake from the fridge? I would refrigerate the frosted cake overnight, and take it out a few hours before the party. Thank you so much! My 8 year old son and I LOVE watching your videos! I am using your recipes but making him a cake that will look like an Oreo cookie and will be decorated with mini Oreos! Can’t wait to see how it turns out! You have inspired me to try out my baking skills! Thanks!! So my buttercream definitely did not come out like yours. It was not as fluffy as yours. I had a hard time spreading it out. There were little air bubbles. The flavor is dead on but the consistency was off. Not sure what i did wrong! Again, great flavor though! up to 2 months! just be sure it’s sealed in an airtight container! Why does my frosting always turn out so thick and heavy? I feel like it weighs my cake down too. What am I doing wrong??? I follow your recipe exactly as it is! My frosting is usually pretty thick! however, if you think it’s too thick you can try adding a bit more heavy cream to make it a bit thinner! I always end up with grainy buttercream. Do you know why? I used powdered/icing sugar as I supposed to. But i never get the silky smooth texture. Hi! Just found your channel and I’m obsessed! For a seven layer (rainbow) 7″ OR 8″ round cake, how many batches of the buttercream frosting should I make? i make 1.5-2, depending on the decorations! if i am just frosting my cake (your best chocolate layer cake) can i just make one batch? The frosting just crusted on the surface! Overall it is still soft on the inside. I have not had any problems with this while decorating cupcakes! It really just helps the frosting keeps its shape! Hi if I’m not able to buy the whole foods butter, which other brand would you recommend for it to not be so yellow? Also is there a difference between brands of powdered sugar? I haven’t tried many others, so I’m not sure. Sorry! I don’t believe there is a difference between powdered sugar brands. Okay thank you anyways! I hope it comes out right I’m going to try it today for the first time! I know that your Buttercream recipe is fail proof but I fail everytime. My frosting is always too thick. The recipe calls for 8 cups of Powdered sugar. Is there a way to measure accurately? I know you had mentioned in one of your tutorials that you use a premeasured box or bag. What brand? If I measure, do I sift and then measure? Or measure unsifted? oh no! I use domino sugar powdered sugar, which is always really fine and clump free! I actually don’t normally sift my powdered sugar (shocking, but it’s never clumpy and I’ve found it doesn’t really make a difference for me)The butter you use can also impact it! I’d recommend adding a bit more heavy cream, and seeing if that helps thin it out and make it easier to work with! really depends on how large of a swirl you’re making! I usually make a half batch of frosting for a dozen cupcakes, but I do huge swirls of frosting!! If i want to make half a batch for a dozen or a little over a dozen cupcakes do i just split all the ingredients in half? If i have leftover frosting, am I able to save it for later? Hi! I’m so excited to make that Jack Skellington cake for my nieces birthday this weekend! I hope it ends up looking almost as good as yours! What did you use for the black drips down the side and the face? Is there a recipe? I just want it to be the right consistency. Also I’m going to try to make this buttercream but I only have a handmixer, do you think it will turn out okay? You may have answered this but there is so many comments. How do you make a chocolate buttercream? I add 1/3 cup cocoa + 2 extra Tbsp of heavy cream! is this amount just added to the original recipe? Just made both the vanilla cake and buttercream frosting and Omgosh let me tell you… they came out amazing! It is on the sweet side but I would just use a thin layer of the frosting if you do not have a sweettooth. I love it just the way it is. Hey! Should I freeze my cake layers before frosting? Also Should I make my frosting a certain amount of time in advance to frosting the cake? I like to, to make it easier to frost but you don’t have to! You can make your frosting whenever, i usually make it the day before just to make it easier to assemble and decorate the cake the following day! How would you exactly incorporate white chocolate into this buttercream recipe ? Or do you already have a recipe for it? ? I’ve never made white chocolate buttercream before! i usually just drizzle white chocolate ganache!! will cakes with this buttercream melt at room temp or it should be stored in refrigerator? it should keeps it’s shape just fine at room temperature!! Can I make my buttercream and cakes 2 days in advanced? Or would you recommend only one. So If I make it Thursday night would it still be ok and taste as good being assembled and eaten Saturday night? Hello, thanks for the recipe, for Nutella buttercream, the ingredients are only butter Nutella and heavy cream? No icing sugar? I have never been very successful at baking, but this weekend I am going to try your buttercream base and make peppermint buttercream. Wish me luck! Hello. Can u tell me do i add real strawberries for strawberry butter creme frosting. I’ve added whiskey, and champagne! But you have to be super careful to only add a little bit, or else the frosting will break! Hi,how exactly do you make your Nutella buttercream. You say to use 2 sticks of butter and 1 cup of Nutella. But how much sugar? 4 cups? Thanks! I will try it today! Can you substitute the heavy cream with milk? I’m sorry, but is heavy cream and heavy whipping cream the same thing? its cream with 38% milk fat! Hi, I was wondering, if I want to make some cake layers ahead of time, what is the best way to store them? These layers can be made in advance, and can be stored in the freezer for up to 5 days! If you do plan to freeze them overnight, be sure to either place them in an airtight container, or wrap them tightly in saran wrap. I’m trying to make this butter cream red but I’m having trouble getting it vibrant enough without the awful food colouring taste. I’ve seen a lot of your vibrant colored cakes and was wondering if you have any pointers. try using the no-taste red gel food coloring! it helps a lot with that! hello, I have a business of cakes, but usually use shortening in my buttercream (or half and half), because Im always afraid my cake could be melting with the hot temperatures, do you recommend something , add more sugar? add another ingredient, I don’t want to put all the time in the fridge I think if the party is outside could be a risk if the cake is cold and the weather hot, what do you think? This recipe does, it’s a rather sweet buttercream! if you want a less sweet buttercream, i recommend trying a swiss merignue buttercream! If I make this frosting a day in advance how do I store it? Thank you! either in a piping bag, covered with saran wrap, or in an airtight container! i will leave it out if it’s overnight, but if it’s made further in advance than that refrigerate it! Should I leave it just on the counter or does it need to be stored in the fridge? Can I use this recipe for piping flowers? Is the buttercream firm enough? How much buttercream do I need if I want to make a semi-naked cake ( 2 8′ cakes and 2 6′ cakes)? I am hoping they look like your semi-naked cake tutorial. Hi! How would you make peanut butter frosting? add in about 3/4 cup of peanut butter, and about 1 extra tbsp of heavy cream! What do you change when you make chocolate frosting? Do you add cocoa, chocolate squares, chocolate chips…? And do you make different types of chocolate frosting? Such as devils food cake frosting, black forest cake frosting, milk chocolate frosting…? I either add in melted chocolate, or add in baking cocoa!! Depends on you taste! I prefer the taste of american buttercream over swiss meringue, but if you don’t have a big sweet tooth or aren’t used to american desserts, this recipe will probably be too sweet for you! 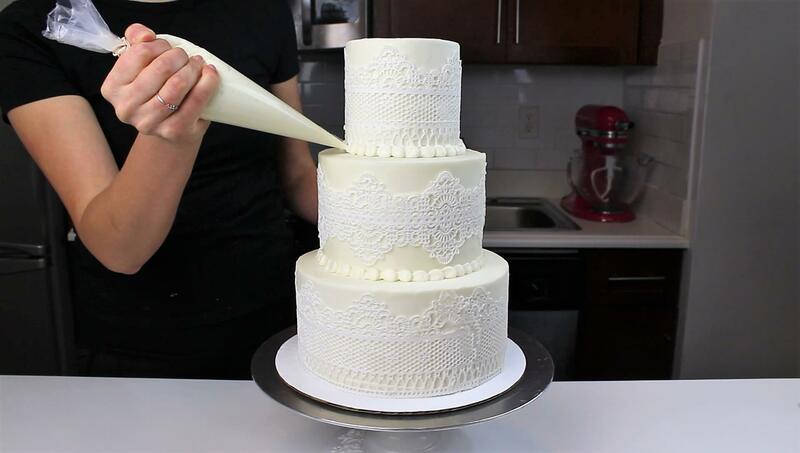 Do you have a video tutorial on frosting techniques using the different frosting tips? I don’t but I definitely should!! Can i use whole milk instead of heavy cream in the American buttercream frosting? Would it still turn out good? yes you can!! it should still turn out just fine! Do your decorated cakes need to be refrigerated by clients? I don’t really sell my cakes! but that all comes down to when someone receives a cake, when they expect to eat it, and the climate! How far in advance can you make the buttercream? up to a few weeks! I store it in an airtight container in the freezer if I’m making it super far in advance, or put it in the fridge if I plan to use it in the next few days. Your cakes are so beautiful! For the rosette cake, which coloring did you use for the top and middle layer of icing? It’s so beautiful! Thanks!! Its actually all the same shade of americolor pink gel food coloring, just in varying amounts! I was really surprised the middle layer turned out that color, but I also really liked it! what if I use 1 tsp gelatin powder softened in 3 tsp water at the end to stabilize the frosting? yes sure, gonna try that on Unicorn theme, wish me luck! I have 2 questions. At Easter, I made chocolate cupcakes and used your buttercream frosting for the grass and added the cocoa and cream as you recommended above for chocolate buttercream frosting. The frosting seemed gritty. What did I do wrong? And lastly, I live in Florida and the buttercream grass just melted. Do you have a recipe for one that is more temperature stable in hot climates? Thank you in advance. Hello, Is it possible to make the frosting a day in advance, or is it better to make it the day of decorating the cake? either way is fine! if you make it in advance, you just need to be sure to store it in an air tight container to prevent crusting! You also need to give it a good stir once it comes to room temperature, as air bubbles can form inside the frosting as it thaws. I just made your American buttercream with cocoa added for the chocolate version and it may be the best frosting I’ve ever tasted! I haven’t frosted the chocolate cake yet but I’m sure it will be amazing . Thanks for your recipes and tutorials. What tip did you use to get the swirls on the flowers of this cake? How do you get such vibrate colors on your fosting? I need to make a basketball cake for my son’s birthday and I need a good orange, but I can’t ever get colors right. Any advise? Hi Chelsey! I love your recipes and have made your cakes twice! I was wondering how you get your buttercream so creamy and easy to frost with? I find I have to add a lot of extra heavy cream (and I let it mix longer) and it’s still not so easy to frost a cake with? It’s a little too heavy and stiff. What’s your secret? Thanks! A lot of factor can come into play with frosting consistency! I actually do use very stiff buttercream, but my kitchen is usually pretty warm! I think this makes my frosting just the right consistency, but I also freeze my layers! This makes them much easier to frost. If you find your frosting is too thick, you can keep adding heavy cream until it’s just right. The type of butter you use can also affect the consistency. Some butter has slightly more water/ less fat than others! Hi Chelsey, Thanks for the buttercream recipe, can’t wait to try it. I would like to know though whether this recipe works well in humid places and if I can use replace some of the butter with shortening. You definitely can, and I recommend you do! It will change the flavor a bit, but it really helps make the buttercream more stable / stand up to the humidity! Hey Chelsey! I have tried to make your buttercream and many others. But I can always taste the sugar. I have added sieved sugar in batches of 3. Whisked for a good amount of 3-5 minutes. It just doesn’t come out right. And I’m from India, so it’s really humid here. when you say you can taste the sugar, do you mean the texture is off, or it’s too sweet? it might be the brand of powdered sugar that you’re using, but overall the frosting is pretty sweet. If you want it taste less sweet, you can try using a swiss meringue buttercream, which is less sweet! Hi Chelsey! I am making a birthday cake for my daughter tomorrow and I was wondering if I can make the frosting tonight and store it in the fridge overnight that way it’s less mess for tomorrow, and if so what do I need to do to it tomorrow before hand so I can get a nice smooth outcome? Thanks! definitely! just be sure to take it out a few hours before you need it to let it come to room temp, and give it a very good stir with a spatula to smooth it out, and remove any air bubbles! they tend to form as the frosting warms up. One one of your live streams I heard you say you make your frosting ahead of time and freeze it until needed. Any special methods for freezing? And how long does it need to thaw before using? Nope! just store it in an airtight container, and let it sit on the counter to thaw! I give it a good stir before using, to remove any air bubbles that may form while it thaws! I love your buttercream recipe and use it everytime I make a cake! I was wondering if I want to make cream cheese buttercream, how much cream cheese do I use and do I still substitute it for 2 sticks of butter like the nutella version? So it would be 2 sticks of butter and a cup of creamcheese? Thanks so much!! Hi! is there a dairy free version of this? i.e without the cream (butter is ok). thanks! You can use almond milk in place of the heavy cream! Hi Chelsea, Does your buttercream need to be refrigerated once on the cake or can the cake sit on the counter? it can sit out for up to a day! Hi! I want to make a chocolate buttercream to frost the outside of my cake. I looked at your Whipped Chocolate Buttercream, but this one seems easier to frost. How do I take this Vanilla Buttercream and make it chocolate? Hi, this recipe is good for fully frost and fill how many cakes? What size? how much would you need for a 3 tiered cake? If its so suppose to be 100 degree weather will this frosting hold? I’d recommend swapping out some of the butter for shortening if you want it to hold up in 100 degree heat. As for the amount of frosting you’ll need, that varies drastically based on how much you add between the layers, and how you plan to decorate it! I usually use about 1.5 batches on an 8 inch cake with four layers. Hope that helps, happy baking! Hi! For the American buttercream, can you substitute water for the heavy cream? No!!! I don’t recommend water, but you could use any kind of milk as a replacement (except soy)! hello Chelsey and congratulation for your work! could you please tell me about this buttercream ,when i use it for a cake , the cake the cake must be kept in the refrigerator or it’s ok outside the refrigerator at a room temperature? It can be refridgerated or kept at room temperature for up to a day! Hi Chels, I’m trying your vanilla buttercream receipe this weekend and was just wondering if I was to have left over buttercream, can it be stored and if so for how long? Hi chelsey I read a few comment and I saw them saying swap some butter for shortening in 100 degree weather. whats the ratio? about how much butter should I use and how much shortening? thank you! Hey Chelsey! I’m making my dear friend’s wedding cake in August and wanted to do a mascarpone buttercream. I love your recipe and want to still use it for this. Would I substitute one cup of mascarpone for one cup of butter? Have you worked much with mascarpone? Love following you on instagram and FN’s facebook live for inspiration! Hi Samantha!! I have made a marscarpone filling, but not a buttercream to cover a cake! i’m not quite sure what the best ratio would be :/ sorry i can’t be of more help! Does this receipt get hard if put in the fridge? you can def make a big batch ahead of time! just store it in an airtight container, and be sure to give it a good stir once it’s thawed back to room temp before you use it! it will get airbubbles as it warms, but these will go away once you stir it with a spatula! HEY! any chance you’ve got a way to do it without the dairy? Is margarine ok? I’d recommend using shortening instead! HI Chelsy! I love watching your videos. I’m really not much of a baker but it’s so fun to watch you decorate. For the recipe, would it work to use salted butter and not add the 1/3 tsp of salt or is it better just to get the unsalted butter? yup, that would work just fine! recipe would you go? 1.5x or 2x to get the right layer thickness? Hello. I live in Florida where it is really hot and humid. I have used this frosting but it does not hold up in this weather. 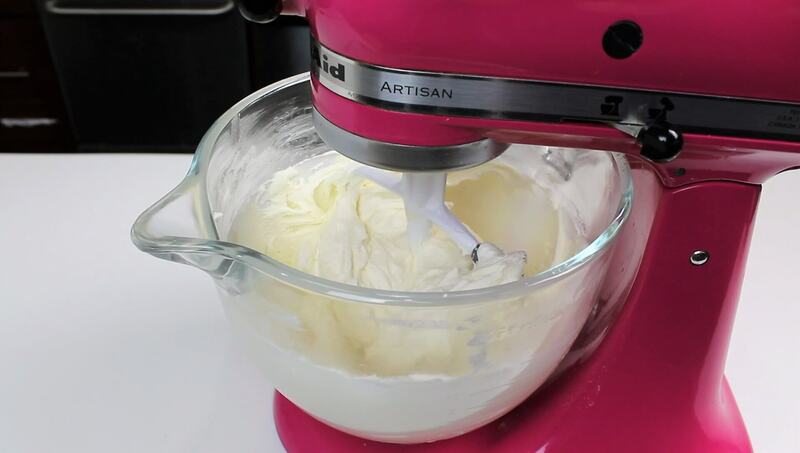 Do you have another buttercream recipe that fairs better in the extreme heat and humidity? I’d just recommend swapping out some of the butter for shortening! Do you have any idea about how much to swap out?? i think most people do half and half! Hi Chelsea, I love the way the frosting flowers look on this cake. I’m a very novice cake decorator. How do u make those flowers? What decorating tip do I need to make those flowers? Hi Chelsea! I love yor recipies and tips! I do not miss your videos! … I have a question, please help me, how is the proportion of ingredients to make it white chocolate buttercream? Hi would like to know is you have a recipe to make 1/2 of your butter cream frosting.I just love your videos . Do you use this recipe buttercream for under fondant?? I don’t make my own fondant, but if you google baked by dan (he’s a fellow food network digital contributor) marshmallow fondant, he shares his recipe which is supposed to taste great! hope that helps, happy baking! How much shortening and butter should I use when replacing the full 4 sticks of butter in the buttercream to withstand 100° weather? oh geeze, at least half!! I’m not sure how much you’d need to stand up to that kind of heat though, that’s hot!! Thank you so much for sharing your recipes with us!!! I can’t wait to try it! Hi there! Thank you for all your insight!!! Do you have a favorite frosting recipe you use for when people ask you for a cake that’s not too sweet? Because American buttercream, to my knowledge, is the sweetest right? I would really appreciate your help on this! ?? it’s definitely very sweet! if someone wants a less sweet frosting, I usually recommend my whipped frosting recipe, or a ganache! Thank you for sharing your recipes. I made the buttercream frosting recipe and color dripped recipe. for how many cake layers can you frost with this amount of frosting. it depends on how much frosting you add between your layers and your decorations, but one batch of buttercream should be enough to cover one 4 layer cake made with 7 or 8 inch cake layers! Hi Chelsea, I’m making a wedding cake in October. Should I freeze the multiple layers ahead of time and take them out the day I frost the cake? I worry about too much moisture when they come to room temperature? They will get some moisture as they thaw, so I’d let the layers sit out and thaw for about 40 minutes before decorating, then assemble the cake! this should help with any issues with condensation! Hi there! I am making your semi naked tiered cake from youtube for my sister’s baby shower on Saturday. 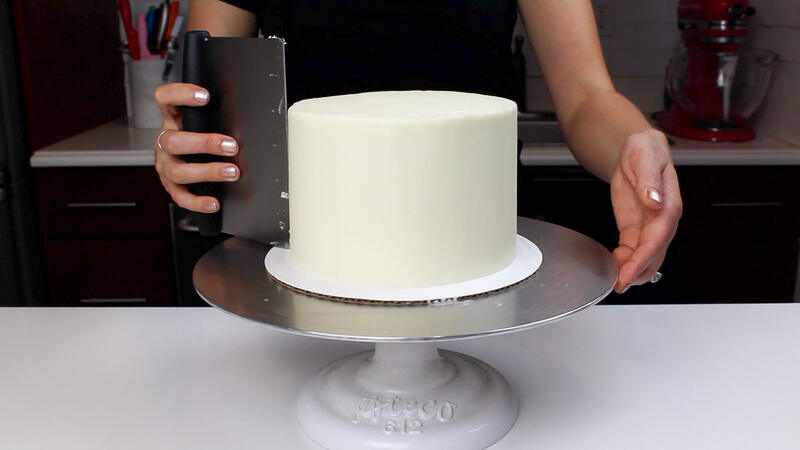 I am using 4, 6″ layers for the top tier and 4, 8″ layers for the bottom half using your classic vanilla cake recipe. How many batches of this buttercream will I need for this cake? thanks so much! I’d recommend 2 batches! you may have a bit of leftover batter, but i like having slightly thicker layers! I’ve made it with 1.5 batches before, but if you’re making 4 layers, they may be a bit thin! Quick questions – when is the best time to add in the food colouring? Thank you!! I like to add it at the end, so I can get a true feel for what the final color will be! Hiya – why don’t you whip the butter before adding the sugar like lots of other bakers recommend? Thanks! I don’t want to incorporate air into it, so that it’s easier to smooth on cakes! Hi. Wanting to make a caramel buttercream. Do you have a recipe for this? Hi Chelsea, love this recipe! It’s my go to for the best buttercream for my cakes. Just curious, what’s the green food coloring for? I’ve never seen that on this recipe before. Is it new? What brand of butter do you use for your buttercream? thanks! I’m a bit confused, because this recipe does include the gram measurements! Hi! I am making a 2 layer 11×15 sheet cake, what would you recommend for the frosting? I plan to use the vanilla american buttercream, and possibly tripling the recipe – do you think that would cover it? Depends on how you want to decorate it, but yes I’d say at least 2 batches!! Hi Chelsea! I’m making a wedding cake in Nov and I’m wondering how many batches of your vanilla recipe I will need for the bottom 14in cake? I would like to do three thicker layers instead of 4 thinner ones. LOVE your vids and advice! You have helped me so much!? If you want 4 thick layers, you’d need one batch of cake for each 14 inch layer (based on the formula of a circle). That’s going to be one huge cake!! 1. If I wanted to make this icing 2 days in advance, do you recommend putting it in the fridge or leaving it at room temp? And do I need to whip it again before using? 2. If I’m making a couple of colors (red, yellow, and black), should I do that in advance or the morning I’m decorating? I recommend refrigerating buttercream if you don’t plan to use it within 12 hours! Sometimes I’ll leave it out overnight, but if I don’t plan to use it for a couple days I pop it in the fridge. Definitely remix it to get out any air bubbles that can form as it comes to room temperature!! I recommend coloring the frosting in advance, as the shade can deepen overtime! this is always great for reds, or other vibrant colors 🙂 Hope that helps, happy baking! Hi Chelsea! Recently started following your Instagram and loving every bit of it! Already made your vanilla cake and edible cookie dough and was a huge hit! If I need to make this completely dairy free is it best to use margarine or Crisco bars? Thanks! so happy to hear that!! To make this dairy free I would do exactly that, swap the butter for crisco, and use almond milk instead of cream! Oh my goodness. I’m making a semi-naked came for my daughter’s wedding in a few weeks, so I’m in the process of recipe testing. This buttercream (with the additional couple tbsp of cream) is AMAZING. THANK YOU!! I actually feel like I might be able to do this thing now. ? Hi Chelsea! I love watching your videos! You make everything look so easy!!! You have inspired me to make my very first 4 tier cake ever! I am practicing today for my son’s cake in November. Your buttercream recipe says 8 cups powdered sugar. But then it says 907 grams. My 32 oz. (2 lb.) bag of powdered sugar says it is 907 grams. But wouldn’t 32 oz. be only 4 cups since there are 8 oz. in a cup? What am I missing??? Hi Chelsea! Can I use Crisco half and Butter Half for this icing? You are great. you can! I recommend that actually whenever anyone lives in a really warm or humid area! Sorry to bother you but can I have the same Bob Ross pumpkin fall spice recipe you did? Is it true that you need to let colored frosting sit to let the color mature/deepen? Or does it just depends on the quality of coloring used? It does deepen! At least that’s what I’ve experienced using americolor gel food coloring. You are so detailed when explaining step by step. This buttercream…. Amaze! Question, after a crumbcoat with your icing, can I chill it, then wrap it, then freeze it? If so, after freezing it, and when I’m ready to put the final coat of icing and decorate, can I do it right away, or should I leave in fridge until it thaws to fridge temp, and then begin to decorate?! Please help lol…. I’m in Hawaii. So I’m going to try the half Crisco half butter. Any other changes needed besides that if making this adjustment? sometimes i’ll also in an extra splash of heavy cream, since the oreos can make the frosting a bit thicker! Aw thanks Jan! I’m actually still working to perfect my banana cake recipe, but am hoping to share it in the next month 🙂 Stay tuned!! I love your channel!! Thank you so much for sharing your wonderful recipes!! My question is: why don’t you sift your powdered sugar? I use C&H and if I don’t sift it, I find large clumps of sugar. Is the brand you use more fine-less clumps? Hi there how do you make your white chocolate buttercream? Hi. Loving all your recipes, tips and videos! I have never seen buttercream made this way! I always whip it to death to incorporate air! Definitely going to try this. Thank you so much! My residents that I cook/bake for will love this! Aw thanks Megan! It’s definitely a rich/thick buttercream, but i sure think it’s tasty 🙂 happy baking!! Good day my dear…. my name is Estelle and I am from Namibia. I love your videos. I want to ask you if you can make videos how to smoothen number cakes from 1 to 10 please if it is possible. I also want to see how you baked your cakes and witch pans you used and so on…. How would I make this a chocolate butter cream? I accidentally used 2x the amount of sugar! ? is there any way to save this frosting? I’d say add in the corresponding amount of butter and heavy cream! Hi Chelsea! I love your videos and decided to try and make my son’s 1st birthday cake using your vanilla cake and American buttercream recipe. When I made the frosting, I found 2 tablespoons of heavy cream was no where near enough and had to end up adding a lot more to get a workable consistency (I was using a hand mixer instead of a stand mixer). What did I do wrong?? Thanks! Hi!! How would you go about flavoring buttercream with fruit? Any time ive ever tried incorporating a jam or puree, it either makes it too soft or runny or not flavorful enough! Hi Chels, are these ingredients enough for 8inch 4 layer cake? Hello from Staten Island! So happy to have found your channel on YouTube. I’m a beginners baker. I love to cook and now recently my inner baker has come out. I have made a couple of cakes and according to all those that have eating it it there good. I have not tried to decorate as of yet. But I think by watching your videos that I’m ready. I want to buy me a turn table, what do you recommend. I saw a set on Amazon that comes with the knives, and the flat spatula looking things (told you I’m a beginner) by the brand of Kootek. Do not want to start with nothing too expensive. I don’t plan to sell them but I want to make them for family and to bless my friends. Also, I’m not too much into very sweet frosting can you please show me how to make a frosting that is not too sweet. Thank you sweetie for all your lessons and great tips. I’ve subscribe to your You Tube channel, Instagram and your blog. Oh my, I think you have a stalker here. Take care! haha if you like your frosting less sweet, I highly recommend one of my whipped buttercream frostings! Could I use a regular hand mixer to make this frosting? Hi there! How many cups of frosting does this recipe yield? Honestly I’ve never measured it, but I’d guess 9-10? some of it depends on how much you beat it/how much air your incorporate into it! Hello, if I wanted to make strawberry icing what would I replace? Would it be easier to use a strawberry extract or a reduced strawberry pure? My cakes didn’t rise that much , not sure where I went wrong ?? Hi Chelsey, when I make this frosting, which I love, it seems much thicker than your consistency and I put in more cream than the recipe asks for. I don’t know what else to do. Hi Chelsy?i have my red gel too ,to color my butter cream but i don’t have super red like you have ..what will i do ?to get really close the super red gel.asap pls thank you ? other brands can work too! I’d just try it and see how it turns out, and if it’s too light, you can always add a tiny bit of black or purple gel food coloring, to try to deepen the shade! Hello, can this frosting be made in advance and then kept in the fridge or frozen until ready to frost? How long can it be kept in either? Your recipes are great, made your mint cake for my husband’s birthday and he loved it! I just realized you address this in the recipe. Sorry for not noticing before! I’m actually about to share an in-depth post on that! fridge up to a month, freezer two months! Just be sure to bring them to room temp, and give it a good stir to remove any air bubbles before you add it to a cake! ?? Hi, I would like to make a non-dairy buttercream. Is there anything I can replace heavy cream with? Hey Chelsweets, one question regarding your ABC, you don’t state whether you use ref. vanilla or the clear vanilla. Does it make a difference in order to keep your frosting super white? How well does this hold up to heat and humidity? Summers in Ohio can be brutal and I am looking for a new recipe that will hold up outside. If you’re worried about the heat, I’d recommend swapping out at least half of the butter for shortening, to help stabilize it!! If you use all butter, it won’t stand up well to the heat at all? Pls can I use margarine instead of unsalted butter? Hi Chika! Sadly you can’t!! the texture and taste will be totally different!! ? Hey I just found your site and really excited about trying your white cake, I’ve had a few people ask for white cake and I am always hesitant because I am worried if it will as moist as my other cakes. So I am going to give yours a try!! Something I read in your comments that I am curious about, I read all your comments, one you said you don’t sell your cakes?? I was curious as to why not, isn’t this why you do these beautiful cakes!! You are so very talented!! Thank you and God Bless!! 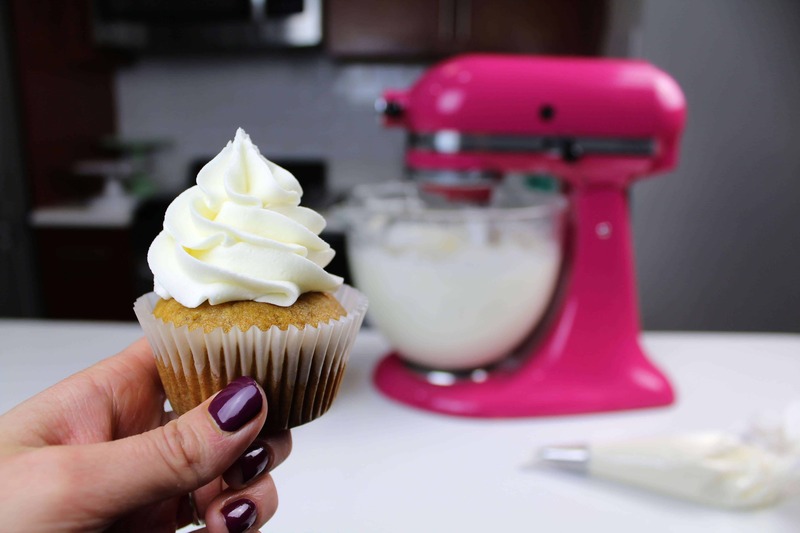 Hi, I was wondering, why do you use a whisk attachment for American buttercream when frosting cupcakes opposed to a paddle attachment for America buttercream when frosting a cake? I have only ever used a paddle attachment when I make American buttercream. Thanks in advance! Why are your instructions different than your video? Adding in the salt and vanilla toward the beginning or the end of the frosting doesn’t materially make a difference, or change the taste! I started adding them in earlier in the process so that I put away my ingredients while the powdered sugar incorporates into the frosting. I’m a big fan or cleaning as I bake! Hey how would I make lemon frosting? Just substitute the vanilla for lemon? Also, add in some fresh lemon zest? Thanks!! Hi! What size bag of powdered sugar do you use in your YouTube video that you explain as the ‘big bag’ and that you say you never have to measure because it equals the 8 cups perfectly? Is it a 32 ounce bag? Thank you! Hi. I’m making a small top tier cake. (three 6” pans) Would I still need this much frosting? You’d probably need less than one batch!! I’d say about 2/3 of a batch, but it can based on how much frosting you add between the layers and to the sides of the cake ?? Hey there! I didn’t read through all the comments so I apologize if this has been asked before. I made homemade buttercream for the first time last night and used your recipe. It was delicious! When frosting my sugar cookies, I like to heat the frosting and flood the cookie so when the frosting crusts, you get a perfectly smooth surface. However, when I did that with the homemade, it was a disaster! The fat started to separate from the frosting. I had to stir it really fast and the frosting base did not self-level. Do you know why I can do this with store-bought frosting and not homemade and is there a way to use this technique with homemade buttercream? Thanks so much! Hi, love your IG page and finally following here too since I’d like to start baking again. I’m looking for a good lemon buttercream recipe. How would you modify your ABC recipe to make a lemon frosting? Thanks! Quick question – have you ever tried to make this buttercream recipe with almond milk? I have, and it works just fine! Love your site and videos. Approximately how much icing (1 cup- 1/2 cup more or less) icing should be used inbetween layers of an 8 inch cake?